Common hogweed is not poisonous. It’s also not to be confused with giant hogweed which has very high levels of furanocoumarins in the sap, and any contact with its sap will give you severe phototoxic burns. It is commonly confused and misreported and a Google search can result in a lot of erroneous information. By and large, common hogweed is safe and perfectly edible under ‘normal’ conditions however it’s important to be aware of the conditions when it isn’t safe. 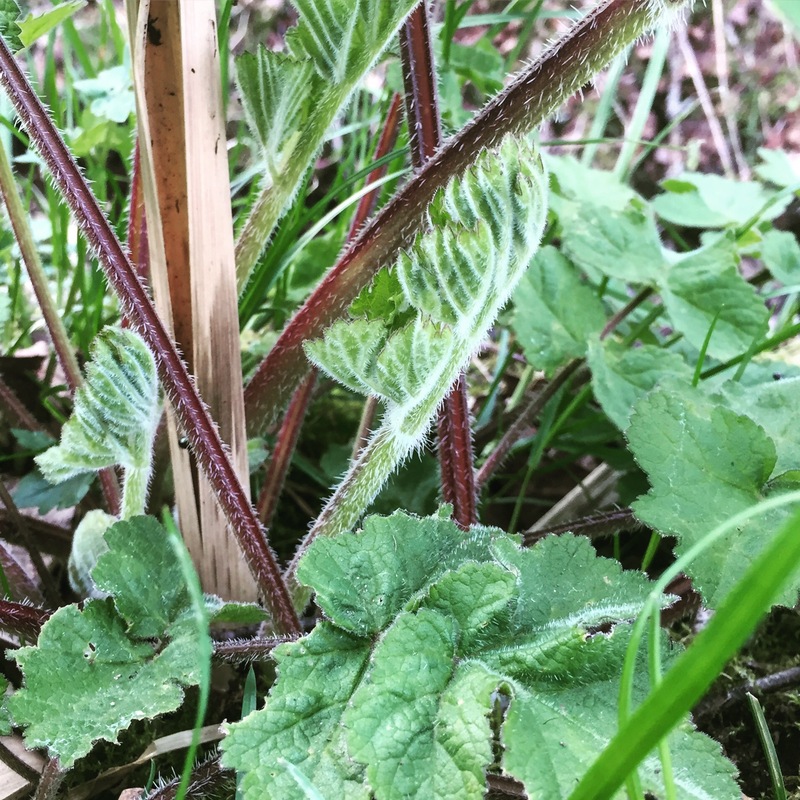 There are reports of people using a strimmer to cut common hogweed who have experienced burns from triggering production of the irritating sap. I was also intrigued by my friend Robin Harford‘s report of another (his seventh) common hogweed allergic reaction reported to him in Devon. So I decided to look at the plant’s biochemistry and research literature to see under what conditions common hogweed could be dangerous. I have 3 acres in Scotland dominated by hogweed and handle it a lot albeit with the respect that I handle all large plants. In all the years that I have taught foraging, I have never personally known anyone have a hogweed allergy. It also has a long medicinal use in mainland Europe. I have picked it when young (without gloves) and eaten it for years: leaf shoots, flower buds, use the seeds as a spice and the root as a tincture and flavouring and I know other people who eat it every year. My friend Mark Williams, also a foraging tutor, says “I have now fed it (well fried, almost to caramelisation) to several hundred people with no adverse reactions reported. In fact I’ve had more people not get on with chanterelles than common hogweed. I did have one experienced forager at the weekend who declined to taste the seeds, having experienced some tingling in his mouth from tasting them in the past. I wonder if the effect may be cumulative in some people? I eat loads and haven’t developed any reaction”. So is common hogweed actually dangerous? Firstly, I do point out to people on my courses that any one can be allergic to anything and that celery – also an Umbellifer in the Apiaceae family – is the leading cause of food allergy in Europe. So I have spent some time reading the research on celery and parsnip allergies, psoralen, furanocoumarins and other exciting stuff. Here are my thoughts based on the research papers I have read. Roots > Bergapten, pimpinellin, isopimpinellin, sphodin. Fruits > Bergapten, isopimpinellin, phellopterin, xanthtoxin, heraclenin, imperatorin, byakangelikol, byangelicin. It is these toxins that induce phytophotodermatitis, irritating the skin of susceptible people and causing blisters with exposure to ultraviolet (UV) radiation in the UV-A range. The furanocoumarins are changed temporarily into a high-energy state when they absorb photons from the sunlight. They then release this energy into the skin where it causes damage to DNA in the skin’s epidermis, causing skin cell death. Sweating, wet skin, and high humidity increase the intensity of phototoxic reactions by increasing the skin’s absorption of the furanocoumarin. What causes high furanocoumarin levels? In some plants, like giant hogweed, furanocoumarin chemicals are always high as a form of defence. In plants like celery and common hogweed the levels can vary. If the levels rise, then problems occur for humans. So what causes high levels of furanocoumarins? The phytoalexin response varies and increases, as a defence mechanism, when subjected to various environmental stress factors. These include fungal infection, copper sulphate (used in a lot of chemical sprays), UV light (England is certainly much sunnier than Scotland) and low temperatures. (For example, frozen parsnips have a much higher psoralen content than fresh parsnips). Here is a report of celery handlers who had reactions to celery that was infected with the white mold fungus Sclerotinia sclerotiorum. Mechanical damage, that occurs during harvesting and storage, has also been shown to increase psoralen concentration by over 45 times. Celery allergies often develop in grocery workers who handle celery, especially celery that has been bred to be pathogen resistant (and therefore high in psoralens). Here is a report of phototoxic reactions while celery handling. Allergenic proteins associated with oral allergy syndrome (OAS) are usually destroyed by cooking. However this is not the case with celery, which may cause a reaction even after being cooked. I believe that common hogweed allergy is really like a classic celery allergy being found in people not necessarily experiencing a celery allergy. 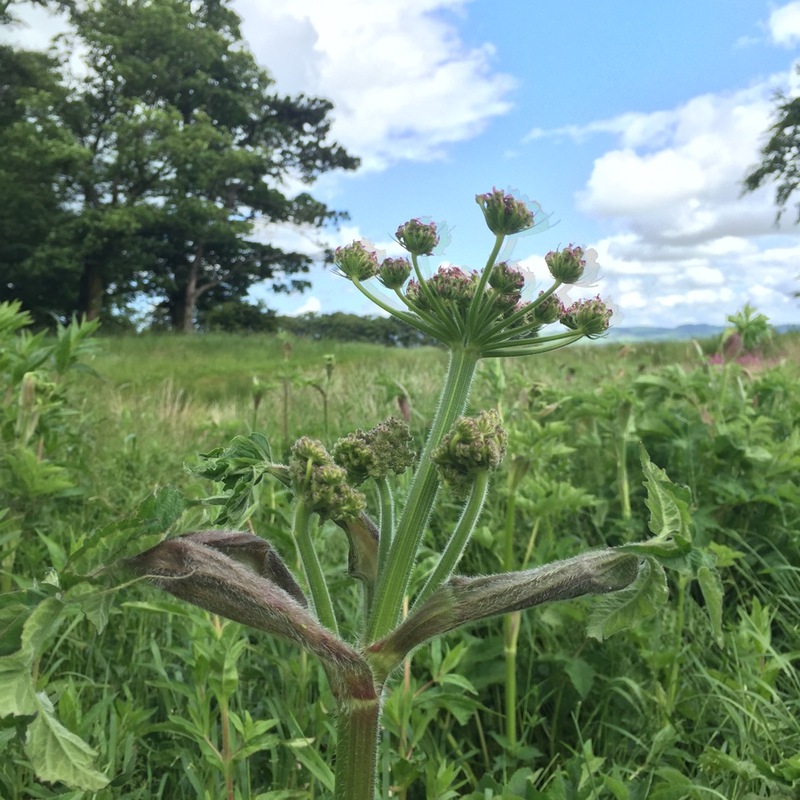 If the furanocoumarins in some of the common hogweed plants reach higher than normal levels – increased by UVA light, pathogen attack or mechanical damage – and exceed the levels found in shop-bought celery, then the allergy will be triggered. Why are allergies on the increase? Interestingly, there are a lot of the problems with celery nowadays (a 4 fold increase in the last 20 years). If it was introduced now as a novel food, I’m quite sure it wouldn’t be allowed on the market! One reason for the increase is that, by selectively breeding the plants to be more resistant to insects and fungi, man has raised the furanocoumarin content in celery to levels which now trigger the allergy in people who didn’t get it before. There are studies comparing people handling different strains of celery which prove this perfectly. Although anyone could theoretically get a phototoxic injury from sap high in furanocoumarins, during normal consumption of celery (and I believe common hogweed) only those with a celery species allergy or the predeterminant qualifying factors (family atopy, recent UVA exposure, 3 pollen sensitives, etc) are likely to ever experience OAS mouth symptoms. People with allergies to alder, birch or mugwort pollen are more likely to become allergic to celery. Typically the sufferer is already likely to have experienced hay fever, asthma, allergies or eczema. with a family history of them also. Many people have no idea that they have oral allergy syndrome until swelling, tingling or pain develops while eating certain foods. There is also evidence that there are more allergy and hay fever sufferers down south as the south experiences higher pollen counts and airborne pollutants. Sun tans and psoralen don’t mix! It has also be found in some studies, that people who have already recently been exposed to sunlight (tanning beds or sunny spells) can react to psoralens when they have not previously reacted to them before. It has also been found that people with fairer, less pigmented skin (e.g. Skin Type I and II) are more prone to reactions than those with dark, pigmented skin. This is borne out by the clinical report of a woman who ate a large amount of celery root before using a sun bed. A comment on this case calculated that 22.5 mg of psoralens were in the 450g portion of celery root she ate. The plants in the south of the British Isles are exposed to more sunlight (and possibly a greater intensity of sunlight than in Scotland). Also people living in the south are more exposed to sunlight. So if you have just got yourself a sun tan, you can theoretically increase your chances of having a reaction. So it is logical to assume that both the common hogweed plant is variable and the foraging person is variable. The former as to psoralen content, the latter as to a predisposition to allergy. Heracleum sphondylium subsp. sibiricum (L.) Simonk. Common hogweed is variable in sap phototoxicity with the most cases of phytophototoxicity reports coming from people who have attacked it with a strimmer. As you read earlier, mechanical damage causes a phytoalexin (furanocoumarin precursor) response triggering the production of phototoxic sap, so a strimmer is a fairly fatal device and will set off the production of furanocoumarins in double quick time! You will also be more likely to suffer if you have been sweating and if it is sunny. Basically when we launch an attack on the plant, the plant fights back to protect itself. They often ‘know’ we are coming. All plants are connected by fungal mycelium in the soil which like ‘Nature’s internet’ transports chemical signals to other plants. Some plants also give off pheromones (scent chemicals) which can signal distress – birch trees, for example, release methyl salicylate when attacked by aphids and other birches ‘smell’ this and start to produce defensive chemicals. So once the first hogweed plant has been strimmed it is likely that the rest of those in the hedgerow sense the danger, and will start to increase their furanocoumarin levels before you even get there! So as with any fight, put on your armour before going into battle and wear protective clothing and goggles. Even strimming nettles can result in minor burn spots with semi-permanent staining. I advise: A) full protective clothing if you’re going to strim any hedgerow. Cow parsley, wild parsnip and even wild fennel have been reported as causing burns. B) if exposed, wash with soap and cold water to ensure all the sap is removed. C) Keep out of the sun for several days afterwards. D) if you are a ranger or employer do make sure that any one strimming for you should be provided with information and full protective clothing when using a strimmer. E) a scythe with a ditch blade is much safer than a strimmer as plants are not pulverised with sap flying everywhere, and just as effective and easy to use if kept sharp. If you attack a cornered wild animal you’d expect to get bitten, don’t forget that plants can’t move and some will also ‘bite back’. I will continue to eat common hogweed and teach responsible harvesting until celery, parsley and parsnips are banned from sale. But if you have a celery allergy or use sun beds I’d advise you not to eat or handle hogweed. And don’t eat it in excessive amounts, especially if you’ve been spending a lot of time in the sun! Here is an interesting study on the effect of different quantities of celery eaten and the effects. It showed that the phytophototoxic threshold dose is not reached by the consumption of celery roots and other conventional vegetables under normal dietary habits. So as with most things, everything in moderation. 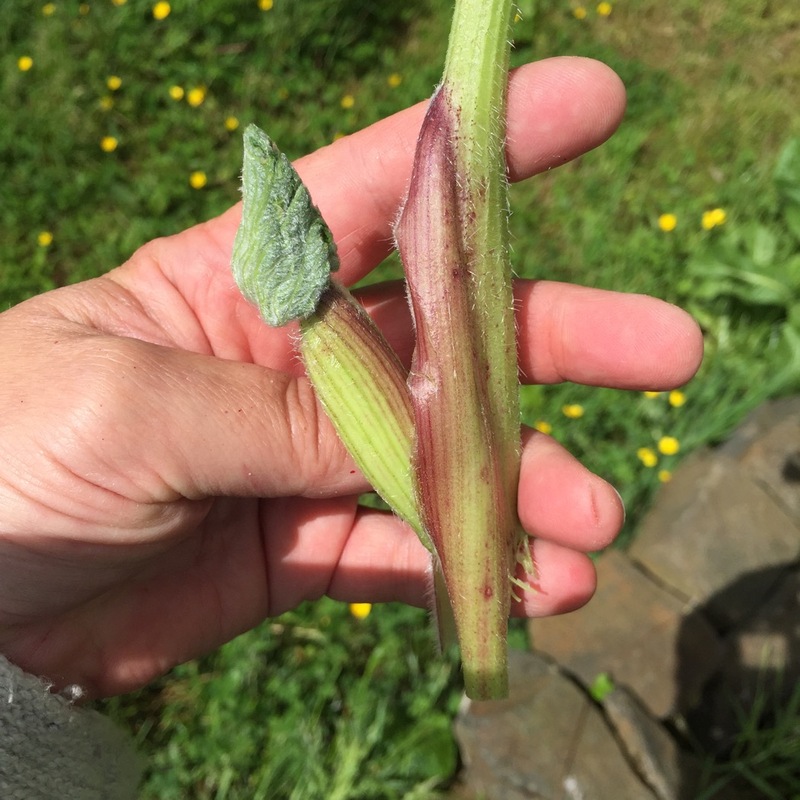 As allergies can be accumulative it is quite possible that his early reactions to picking celery sensitised him and is causing contact dermatitis when he handles hogweed. Interestingly, I have a friend who took up juicing. He liked the apple, carrot and celery combination and instead of varying different juices throughout the day, he drank only this combination for about a month. He was juicing two heads of celery, a bag of apples and a bag of carrot and drinking it daily. After about a month, when the summer arrived, he started to get dark pigmented patches on his face. They reminded me of the melasma experienced by some women as a hormonal change. As his health was otherwise good, we could only put it down to a phytophotodermatitis reaction to ‘overdosing’ on celery juice (although perhaps it was the carrots?). For the last two years, in the summer as soon as his skin starts to tan, the patches reappear in exactly the same place, although, in his case, this is not accompanied by any itching or pain. So the compounds in celery juice can certainly start a phytophotodermatitis reaction. There are also documented cases that dark, pigmented facial burns can also happen from ingesting too much citrus fruit when also in contact with sunshine. Here is also a case of a woman who developed lesions several hours after she had baked a key lime pie from scratch. Part of the preparation included squeezing fresh limes by hand; afterwards, she walked outside on a bright, sunny day. The picture below shows the burns she experienced. Bartenders who make cocktails and chefs who squeeze limes and lemons should be aware of this and avoid going out in the sunshine after handling a lot of citrus. While grapefruit juice also contains furanocoumarins it seems that they are weaker and of low concern. It seems that the coumarin derivative limettin present in limes is to blame. Parsnips can also be problematic as they too contain furanocoumarins but again, it seems to be all in the amount eaten and the exposure to sunlight, as a 200g portion of parsnip seems to be under the threshold. Some people also experience contact sensitivity to carrot, parsnip and celeriac, all members of the Apiaceae family. Heracleum maximum (prev. H. lanatum) known as cow parsnip in North America can give the same type of burns as giant hogweed. It is, confusingly, occasionally also called ‘hogweed’ although it is not the same species as the British common hogweed but closely related. Here is the case of an 11 year old boy in Alaska who experienced burns after coming in contact with H. lanatum. Every now and then there are reports of contact dermatitis caused by carrots too Report 1. Report 2. and another common Apiaceae herb, a parsley reaction in a boy and phytophotodermatitis in pigs exposed to parsley. Carrots and parsley are also related to celery and hogweed. As even the most innocuous foods, not just in the Apiaceae family, such as the humble lettuce can cause allergies, it is sensible when trying a new food always to try a small amount first. I have just been burned through my protective trousers and T-shirt from strimming hogweed. The burns are just as bad as on my exposed arms! I’m so sorry to hear that. I was strimming yesterday in full battle gear. Usually I use a scythe which is far, far safer. Apply dock leaf gel https://monicawilde.com/how-do-dock-leaves-work/ if you can find some now. Gels with a little lavender essential oil in also work well to calm the burns down again. Back in the Summer of 2014 I was working on an Estate on the Isle of Mull. I was strimming and happened to hit a clump of Common Hogweed. Of course it was quite hot and sticky so by this point I had taken off my longsleeved top, and the helmet and visor didn’t happen to have the cloth neckguard fitted. I got splattered. Instantly knowing I was in trouble I rushed to the nearest water point and washed off as best I could, but by this point the damage had been done. Over the next few hours (and following days) the skin on 3/4 of my arms and around my neck/clavicle broke out in dozens of 5 pence coin (and smaller) burn blisters. Thankfully because I was able to wash it off fairly quickly the burns were not terrible, or particularly painful – though it did take nearly two years for the marks to fade away. I have no recurring photosensitivity in those areas thankfully. A lucky escape! Thanks for sharing that. I wish the estates would invest in good scythes. I use one instead of a strimmer and it takes out the hogweed cleanly without a splatter. Brilliant article on Common Hogweed the best I’ve ever come across. I have a paddock full of it and it burnt my horses on any white pigment areas they had. Had to detox them using Milk Thistle but since found a supplement that was a lot stronger and helped heal o e of the horses who took ages to heal. Please may I share this article in the horse community? Thanks. Yes do share a link with your community. Fairy liquid washing up liquid always works for me. Istant neutralise the hoqweeds poison in secounds. i was cutting common hog weed with my bare hands and putting on my horses track for them to self-select, however my right hand has felt slightly weak since doing this and a bit sore I think it could be a reaction to the hog weed so will definitely wear gloves in future. I’ve not heard of weakness as being a side effect, just photosensitivity and burns. Fantastic article thank you. I have common hog weed In our somewhat neglected garden and have cleared it with loppers when young but one plant has suddenly burgeoned and is going to need removal so I was checking how careful I needed to be. I will now be cautious with it. I’ve never had problems picking or lopping but best to take care. It’s the strimming that seems particularly bad and where they are in quantity. Hello. I’ve been a hunter gatherer for about 44 years now, and I remember my father giving me advice. 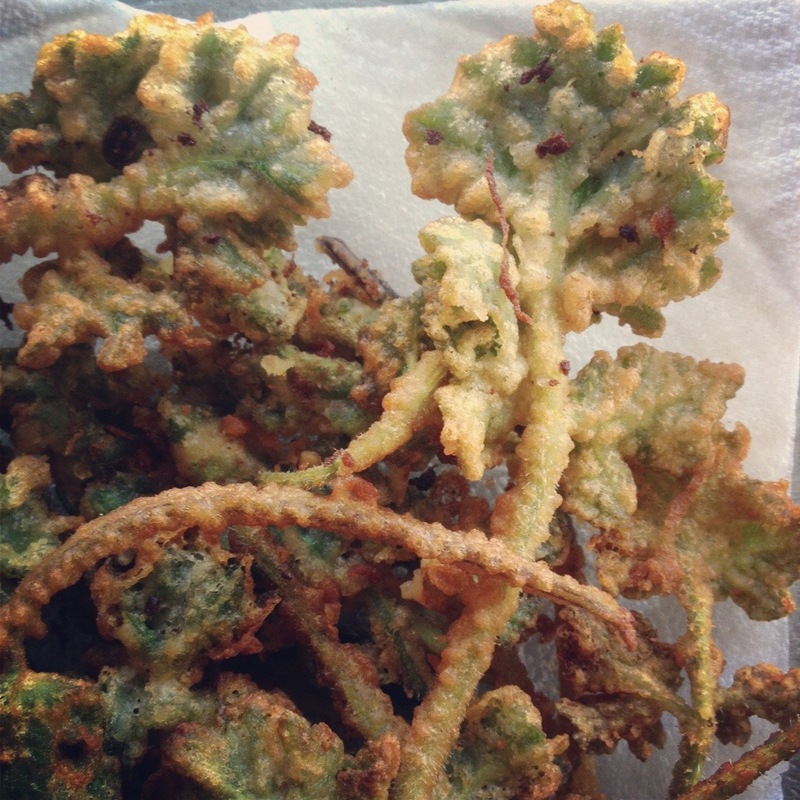 – He said, “Eat a very tiny piece of every plant available in your environment.” For myself, this has worked, so far! I wouldn’t expect anyone else to do this, unless they gain a knowledge of each of these plants – and I mean some fairly mean chemistry! Obviously, some plants such as Monkshood are to be excluded, as are a few of the fungi’s. Perhaps I am very lucky, or my constitution is strange! – I would say that if a person moves to a different part of the country to be aware of the fact that plant chemistry can vary quite a large degree. Try to be aware of your environment, as 9 out of 10 folks who ask me what I am foraging for have no idea as to the name of the plant and have no knowledge of what herbs are edible and what are not… I had the benefit of folks who knew these things and were willing to explain to the 9 year old, interested me! If you don’t know what it is, don’t touch it. Take a photograph and use the internet to find a local person who has knowledge of these things… Blessings, And be careful, and you will be fine. Regards. Steve.